Dan Billingsly (photo) has added to the attacks by others against God’s law on marriage with the novel teaching that all of the text of the Gospels, save the sections in each that are post-resurrection, constitute Old Testament teaching that is obsolete. For example, Matthew chapters 1-27 are said by Billingsly to be Old Testament and chapter 28 New Testament. This is a ridiculous assertion by Billingsly which makes the teachings in the Sermon on the Mount to be Old Testament teaching that are, in his words, nailed to the cross. Are the words, “man shall live by every word that proceeds out of the mouth of God” Old Testament only? Is Jesus’ lesson to the rich young ruler in Matthew 19 to leave everything and follow Him just Old Testament morality or was Jesus depicting the depth of commitment required in His kingdom? That someone would relegate Jesus’ teaching in Matthew 19 to obsolete Old Testament Law is troubling. When it is pointed out to Billingsly that Jesus commanded to the disciples in the Great Commission (Mt. 28) to teach the ones they baptize “to observe everything I commanded”, Billingsly says that meant to teach everything Jesus said during that 40 days after the resurrection. This can’t be proved. Now I do believe that the Old Law is nailed to the cross (see Hebrews 9:15,16,17), but the Gospel preaching of Jesus is not nailed to the cross! Billingsly’s teaching makes all of the calls for repentance and carrying the cross Old Testament teaching. Now one has to wonder why Billingsly would suggest something so ridiculous. There is one primary explanation for Billingsly putting forward something as absurd as this and it is nullify and explain the teaching of Christ on Marriage, Divorce, and Remarriage in Matthew 19:9-12, 5:28-32; Mk. 10:11; and Lk. 16:18. If most of the text and teaching in the Gospels are Old Testament, which is nailed to the cross (Eph. 2:14,15; Col. 2:14; 2 Cor. 3:7-8), then Matthew 19:9 is no longer an issue of concern. But if Billingsly is wrong, and if Jesus’ teaching in the Gospels comprise the foundation of the Gospel (Good News), then the church must continue to deal with these difficult issues where people are living in sin. Billingsly has taken a crafty approach to the Scriptures by delineating between the Old and New Covenants on the basis of the what Jesus said before the grave and what He said after the grave. Why someone can’t see that Jesus could speak of the New Testament in His blood prior to the cross is perplexing. This point is so elementary that to not get it requires that the ears be plugged and the eyes be tightly shut. Jesus told the disciples that they would be sent a Comforter that would help them after He was gone back to the Father. The Comforter, the Holy Spirit, was going to give them a ready recollection of what Jesus taught them. “26 But the Helper, the Holy Spirit, whom the Father will send in My name, He will teach you all things, and bring to your remembrance all that I said to you.” (John 14:26) When Peter, James, and John went out preaching the Gospel, be assured that they were teaching the same Gospel that Jesus preached. The idea that Jesus taught Old Testament and the Apostles are the ones that taught the New Testament Gospel is out of line and an utter perversion of what Jesus did. But the perversion must be accepted if Matthew 19:9 is to be nullified. Dan, you’ve hit the nail squarely on the head. Brother Billingsly has been campaigning this error for years; in his writing he finally gets around to the subject you note, namely, Jesus’ teaching on marriage, divorce, and remarriage in Matt. 19. Every error has an under-surface agenda, and in this case that appears to be it. As you note, it is easily answered: The doctrine would include the instituting of the Lord’s Supper as Old Testament doctrine not intended for Christians–if not, why not? Matt. 26:26 is just as much “before the cross” as Matthew 19:9 is. Yet I have no doubt that brother Billingsly faithfully communes with the Lord every first day of the week. Truly “the legs of the lame are not equal,” Prov. 26:7.The Sermon on the Mount is, in my opinion, the definitive answer to this error. contrary to what some would like, Jesus contrasts Old Testament teaching to New covenant doctrine: “You have heard it was said…” in each case points to an identifiable Old Testament teaching, not just a “perversion” of that teaching as some would assert. “…but I say unto you,” on the other hand, does not–because it is new, part of the New Covenant. Good writing, Dan. Thanks. I have never heard this taught in the church. I’m glad that our church family is not involved in this error. You think that putting a title page at the beginning of Matthew, marking the beginning of a new era of revelation from God – with 400 years of silence since the old was completed – and marking the pronouncement of the coming kingdom constitutes an error? Dismissing that as an error of the Catholics, as Mr. Billingsly does, it more prejudicial than factual. Where would you mark the beginning of the New Testament? At Acts 2? Well that would leave out a whole bunch of teaching from Jesus Christ, now wouldn’t it? I understand, as do many Christians, how getting rid of Matthew 19 solves many problems for those who are divorced and remarried, but it doesn’t really because Matthew 19 was retelling God’s perpetual law that He laid down from the beginning that “what God joins together, let no man separate.” So if you want Matthew 19 to be old testament, fine, but it is also God’s unchanging law for marriage, pre-Mosaic, from the beginning of the creation. Compare Genesis creation account “in the begining” and Jesus’ words in Matthew 19 “from the beginning God made them male and female” and ” “So they are no longer two, but one flesh. What therefore God has joined together, let no man separate.” (Mt. 19:5,6). Billingsly with his new doctrine that he is peddling through emails to church secretaries does not really solve the problem. The only thing that solves the problem is God’s grace to the repentant. I know 4 a fact that Mathew-John Describing Jesus B4 the cross is without a dought 100 Percent OLD TESTAMENT. This Nonsense that Jesus starts Teaching New Testament while the Old Law was still in force is just Plain Stupid. Harmonze these two Passages here. John 7:16 with 2John 9-11 I Wonder how We today can Abide in Jesus New Testament Doctrine over in the Apostles Doctrine, if B4 the Cross Jesus said CLEARLY MY DOCTRINE NOT MINE. Makes You Wonder does it not? Yet this Foolish Heresy still goes on Week after week, and many Souls are lost because of it. Romans 3:19-21 Romans 10:1-6 Galatians 2:16 Galatians 5:4 Mathew 5:17-18 Mathew 7:12 Galatians 1:6-9 Wow how Serious is that one Bretherin. DON'T PREACH ANY OTHER GOSPEL THAN THE ONE THE APOSTLES PREACH. Acts 2:42 Mathew-John is ANOTHER GOSPEL. It Was The Gospel of the Old Mosaic Covenant Kingdom.Exodus 19:5-6 Mathew 4:23 Mathew 1:21 Mathew 10:5-6 Mathew 15:24 Galatians 4:4-5 Romans 15:8 Use King James Version on all of these passages. Not Hard to figure out when You get past that Stupid Misplaced Title Page. Check this info out. The passages you offer from John 7:16 and 2 John 9-11 do not contradict that Jesus was teaching the Gospel of the Kingdom of Christ. As the Son of Man, obedient to the Father, He wanted the hearers to know the source of His teaching – from the Father in Heaven. That truth does not in any way mean that Jesus was teaching the New Covenant. It is your error to think that by teaching today what Jesus taught during His earthly ministry is to teach Old Law and justification by works. This is simply not the case. The passage in Galatians 1:6-9 is indictment against all people like Billingsly who regularly dismiss the teaching of Jesus Christ, for the sole purpose of getting around His teaching on divorce and remarriage. These carnal motives are transparent. What Jesus taught on divorce and remarriage is not merely Mosaic Law, it is the law of God from the very beginning. God's design of and restrictions on marriage transcend the Mosaic Law and applies to all periods and epochs. to Israel? Mathew 21;43 So if Jesus was Preaching the Kingdom of Christ as You say He was, He Took His Own Kingdom away how Interesting. We know where We stand on the Covenants do You Bretherin? I Seriously Dought it.Galatians 1:6-9 DON”T PREACH ANY, what part of ANY do You People have a Problem WITH? Other GOSPEL, than WE APOSTLES PREACH. Not Hard to Understand Acts 2:42 Again John 7:16 JESUS SAID MY DOCTRINE NOT MINE. In Acts 2-Revelation 22 It IS ALL JESUS DOCTRINE, Cause HE JESUS Is HEAD OF HIS NEW COVENANT CHURCH 2 John 9-11 I challenge You to Refute this. Post it and Refute this Please. You might want to do a little more study. You write, “Art Thou Bound (MARRIED) to a Wife Seek not a Wife…No stipulations”. You are incorrect. Implied is that you are scripturally loosed from a spouse because verses 10 and 11 already limit the person's options. In the verses you refer to in verses 27,28, he is speaking generally about the institution of marriage. Some people are not married and they may marry. Some people are scripturally divorced and they may marry. Jesus is the head and author of the New Testament, which he introduced during his earthly ministry, and instituted after the cross. If you weren't trying so hard to keep adulterers in their adulterous relationships, you would see this. Jews were misusing the Commandment. You Cannot Scripturaly Answer My Refute of Your False Teachings of Mathew-John B4 the Cross. JESUS TOOK THE OLD TESTAMENT KINGDOM HE PREACHED To Israel From Them after they rejected Him. Christians, but Jews who were still His Old Covenant People to be PERFECT In THE LAW OF MOSES. Deutaronomy 18:13 Just How much Proof do You kneed to Finaly Get the Picture Traditionalist? Wake up and Smell the Covenants. When the going got Tough looks like You got Going, because You never posted My last Post which Devestated Your False Traditional Stance on Mathew-John B4 the Cross. I Showed Clearly You were Dead wrong on the I Say Unto You Passages. I showed that When Jesus said to Observe All I Commanded You it was those commands after the cross. Acts 1:1-3.Is this the way with all You Die Hard Traditionalist. When Your False Doctrin is exposed You refuse to post the evidense. Typical. I Challenge You to post My Last Damning evidense exposing Your Foolish Traditional Stance.Go for it if You have the Courage. Let the People see for themselves. Mickey, I posted your comment and you should have seen that before making your second comment. Anyway, it is now posted twice. No, you didn't destroy anything but your own credibility. Jesus didn't say for the Christians to only follow His commands given after Acts 1. The damnable doctrine is Mr. Billingsly's that takes away from Jesus' teaching. There is no credible person who would suggest that the Messiah's teachings before the cross only related to the Old Law and not to the New Covenant. When the Holy Spirit came on Pentecost, the Apostles received that promise. The Holy Spirit taught the Apostles and He reminded them of the teachings of Jesus. Why don't you just admit it. You hate what God said about marriage. You think Jesus' words in Matthew 19 “what God has joined together, let no man separate” applies only to Moses' Law? Stunningly wrong. Let's move on and leave our discussion here. You are indoctrinated into Billingsly. I am indoctrinated into Jesus Christ, all of His teachings, and there is no reconciling. So, I guess that being a Christian really is more than having a “relationship with God or Jesus”. I guess is is filled with doctrine and religion and stuff? Dear Anonymous, It is sad that you would say this. You can't possibly believe that correct doctrine (2 Jn 1:9, the word is “doctrine”), “pure and undefiled “religion” (Jas 1:26,27), and other “stuff” like “not exceeding the things which are written” are not part of the relationship we have with God. But I'm not surprised, not really, to see that true doctrine and religion are unimportant to people who believe Billingslyism. Does not the great commission include a command for Jesus' apostles to teach “all nations” (i.e. gentiles) “to obey everything I have commanded you” (i.e. things he told them…Jews…before the cross)? Is that ambiguous? Does “everything” admit of a limitation? Dear Anonymous. I'm not sure on what your point is. Yes “everything” Jesus taught about the Gospel and the Kingdom and salvation is to be taught. It's interesting how Dan Billingsly's supporters get all angry and write insults and leave their posts “anonymous.” Every false teacher and his followers get all angry and insult you if you don't agree with them. They get all psychotic if you show them the truth and they also start screaming and stuff. Wow…what a way to show their christianity! Anyway, thanks to all who stand for the truth. Luke makes it clear that the neither John the baptist nor Lord taught “the Law and the prohets”! And it is most interesting that Jesus' teaching on marriage and divorce comes right after that statement. Yes, Jesus taught the Jews to be faithful to the law – so long as it was valid (the rich ruler, the lepers to the priests, etc.) – but HIS TEACHING WAS NOT OLD COVENANT. Luke says it wasn't! Do we beleive Dan Billingsly, or Luke? Luke makes it clear that the neither John the baptist nor Lord taught “the Law and the prohets”! And it is most interesting that His teaching on marriage and divorce comes right after that statement. Yes, Jesus taught the Jews to be faithful to the law so long as it was valid (the rich ruler, the lepers to the priests, etc. ), but HIS TEACHING WAS NOT OLD COVENANT. Luke says it wasn't! Luke 16:16 Mathew 11:11-12 This is Simply Talking About B4 John's Ministry The New Testament Kingdom Was Prophesied About, But During John's Ministry It Was Preached That it is At Hand, No Revelation Of New Testament Doctrine, But Only At Hand Ephesians 3:3-5 Both Jesus And John Preached The Kingdom Being at Hand.What Is Jesus Teaching After John's Ministry Traditional Brethren? 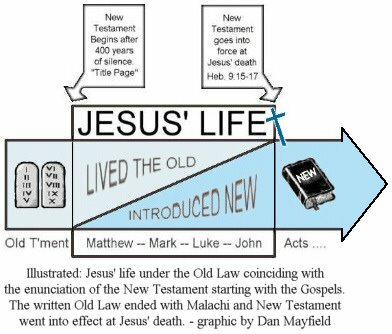 Mathew 5:17-18 Mathew 7:12 Don't Look Like A New Era To Me.Romans 7:4 Romans 10:4 Jesus Not Malachi, Or John The Baptist Is The End Of The Law.Show Us This New Era.Luke Said No Such Of A Thing About Jesus Teaching New Testament. Your GREATLY In ERROR Here.Jesus Was Saying That Heaven And Earth Meaning The Old Covenant Age Would Be Easier To Pass Away Until All The Law Of Moses Be Fulfilled. It Is You Brethren Who Teach Damnable Heresies About Mathew-John B4 The Cross Being New Testament. Shame On You For This.Show Us One Verse Where Jesus States He Is Teaching New Testament Doctrine. Hint You Will Not Find It. Mathew 4:23 Was The Gospel Of The Old Mosaic Covenant Kingdom The Jews Were Still Under, And That Kingdom Was Taken From Them After Jesus Death. Mathew 21:43 Mathew 1:21 Tell Us How Would Jesus Save His People Still Under The Law By Teaching Both The Law And New Testament At The Same Time? Romans 3:19-21 Romans 10:1-6. Basically You Are Saying Jesus New Covenant Is Not Good Enough To Save Us Right? Acts 2-Revelation 22 Acts 2:42 John 6:38 John 7:16 Cannot Harmonize Period.Mathew 28:18 All Authority Was Given To Jesus After Not B4 His Earthly Ministry.There Fore Commen Sense Dictates All New Testament Truth Of Jesus Was Revealed After His Death. Acts 1:1-3. Refute This Traditional Brethren. I Challenge You On This One. It makes me wonder what kind of drugs you were on when you composed this drivel. I have had to deal for more than a decade with the lunacy of Dan “It's all about the title page” Billingsly. It's a shame that the illiterate have to enter into the conversation as well. That old argument saying that the New Testament title page was an innovation by the Roman Catholics, is just as dumb as THE OLD PATHS ADVOCATE saying G C Brewer introduced individual communion cups into the Churches of Christ in 1919. Insanity! Would you say Matthew, Mark, Luke and John were to the Jews, and not to the Gentiles? I heard this preached yesterday (12/6/2015).